Everyday has seemed to be non stop here, not in a bad way but there is simply so much to see and try. I've decided to condense my posts into our Tokyo stop, Kyoto stop and a couple of meal high lights. So this is a long one, but there's lots of pictures. Our first night in we got in pretty late and managed only to explore the area around our hotel. We chose a hotel right on the train station to make it easier to run around town. (a very wise choice by my wife) Above is a picture from our room of the Tokyo tower. For dinner we picked our place by looking at the famous "plastic food menu". 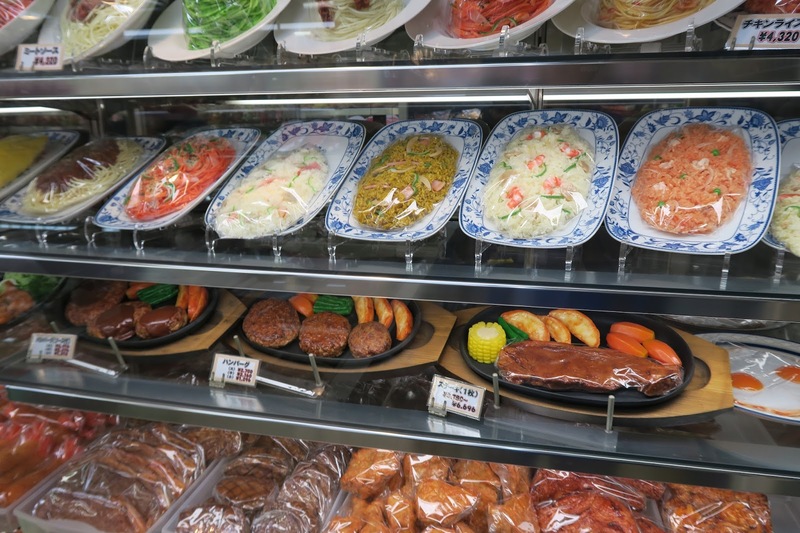 Basically each restaurant has a full menu recreated in very realistic plastic representations. I opted for the sashimi set, my wife picked the Chazuke marinated snapper. Her tray came with a carafe of hot tea that you pour over your bowl of rice, fish and condimente, like a soup/stew. We particularly enjoyed this "Bakudan mix" side dish of Natto, pickles, minced tuna, okra, quail egg and daikon radish. Asian food features texture as a large component of a dish, I never really noticed how much use of the "slimey" texture there is here, this dish is indeed very viscous. Natto is a type of fermented soybean which is very sticky if you think about cooked sliced okra it's about like that, so the whole dish was pretty um.. "slimey", but tasty. It reminds me of another favorite of mine Takowasa. 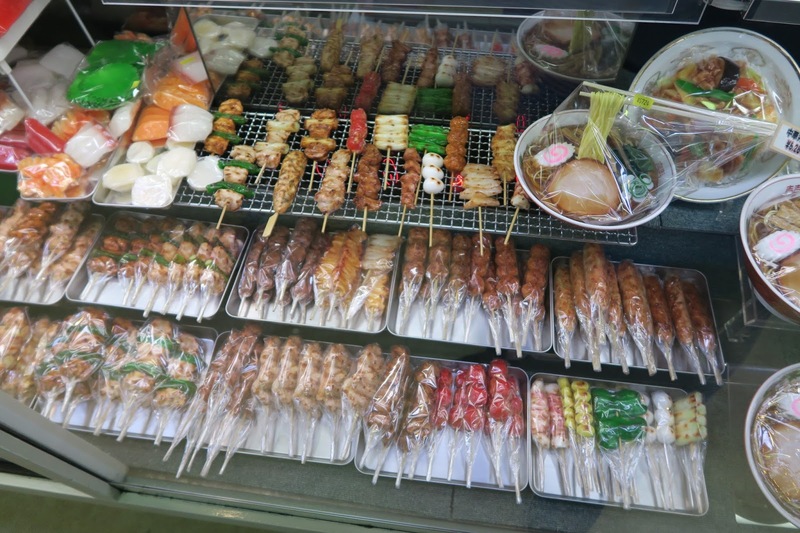 The next day we hit the fish market and in the afternoon visited what I call "the happiest place on earth": Akihabara, the anime and electronics district. The UDX building is a paradise of Anime shops and museums. We didn't get a chance to go in there. 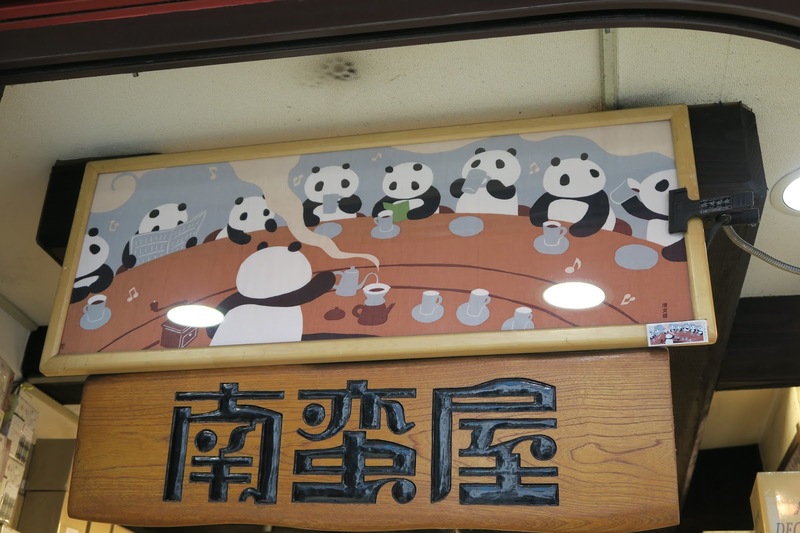 Here's a picture of the AK4B "maid cafe" sounded like a big show was going on, basically it's a cafe where all the servers are pretty young girls dressed in french maid costumes. We didn't go in there either, although my wife was encouraging I felt like the place was going to be like this middle eastern restaurant I went to where they had belly dancers dancing next to you and I just felt uncomfortable the entire evening. 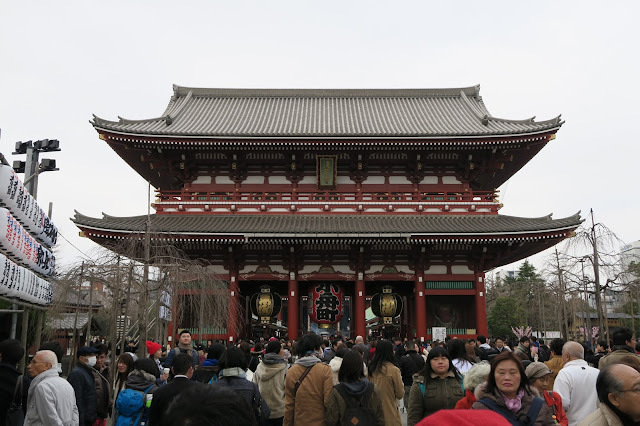 The place seemed to have a lot of folks going in and out so it was definitely hopping. Basically every store in the area was a Tax free electronic store. You won't necessarily find a good deal, but you will find the latest and greatest of gadgets that aren't sold anywhere outside of Japan. It just so happened the US dollar is currently very strong so I picked up new camera. The stores didn't just carry video games and electronic gizmos but also kitchen wares, cosmetics, food courts and even an arcade, the one store we were in had at least 11 floors. 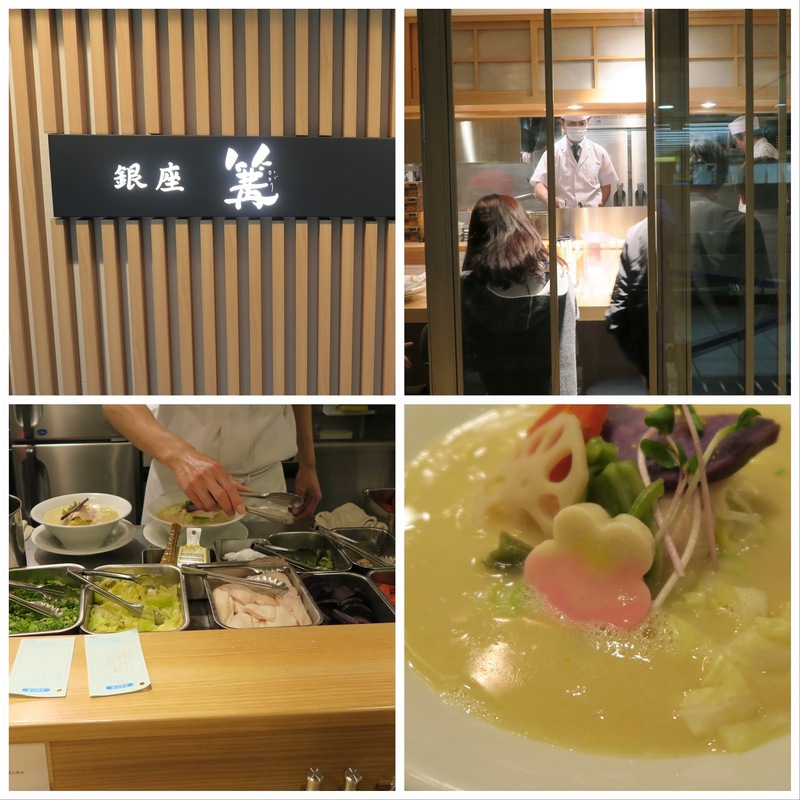 After a full day we went back to Shiodome station and grabbed some Ramen at Kitakata Ramen Bannai. 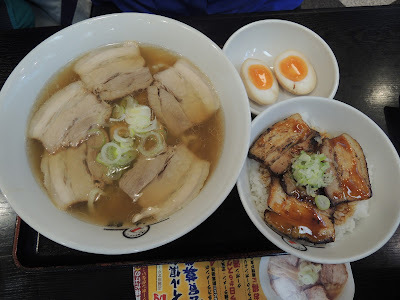 I opted for the wonton Ramen and my wife got the char sui set that included grilled pork char siu and soft boiled egg. None of the ramen here featured the thick broth style that we've come to know as "real ramen" back home, evidently everyone has their own style which includes broth thickness, noodle type and condiments they are served with. 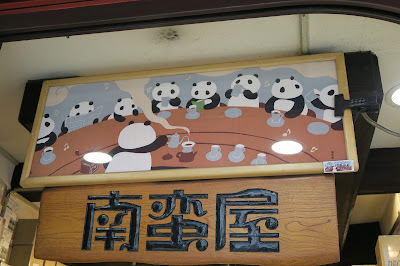 We started our third day at a Japanese Onsen. It's actually a relaxation wonderland. When you arrive you are given a Yukata to wear, it's a light robe and sash for a belt and everyone walks bare foot around the facility. The pictures all look like we were outdoors at night but this was actually a giant indoor complex (it was just before noon). It Featured both indoor and outdoor baths (guys and girls side separate of course), foot pool, salt room (for napping), massage, amusement park like games. 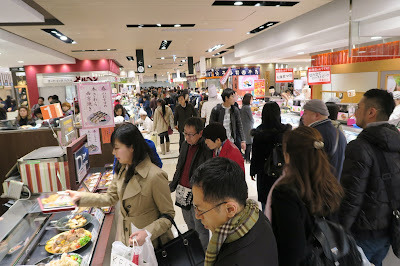 And of course a giant food court, with lots of different restaurants. 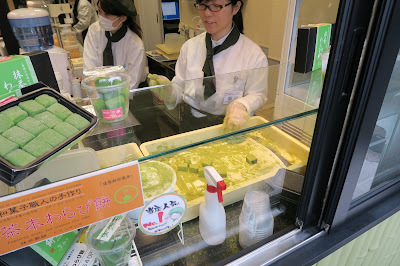 For dessert we had some shaved green tea ice with powdered matcha and condensed milk. The ice was very light and fluffy, like freshly fallen snow. You could easily spend a whole day and evening here. The facilities open until the AM the next morning ("if you stay later than 2am there's a extra fee charged") and there is a hotel onsite where you can stay in a room with private onsen which we would have gladly done but we had dinner plans with a friend (more on that later because it was awesome and deserves it's own post). 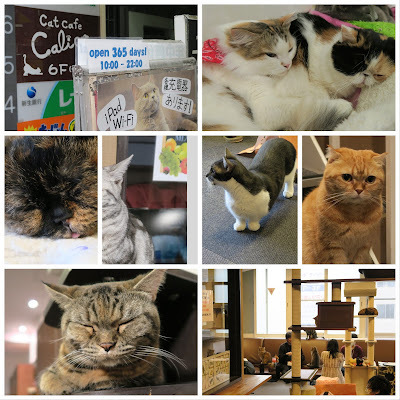 For our fourth day we hit a "cat cafe". I had envisioned a typical coffee shop atmosphere with loads of cats wandering around. It was more like a giant room for cats where people were wandering around. Very unique experience, however it made me miss my own cat that I had to leave behind in the US. I superstitiously asked all the cats to send their well wishes to mine since she is old and ill. I think it would have worked better I bribed them with food. We met up with our friend who was nice enough to show us around. 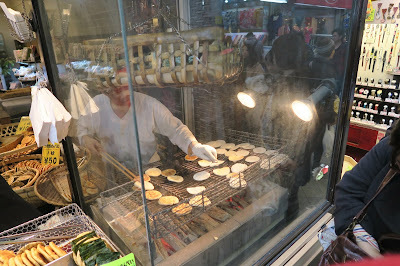 We went to the restaurant supply district which was next to the "fake food" district. 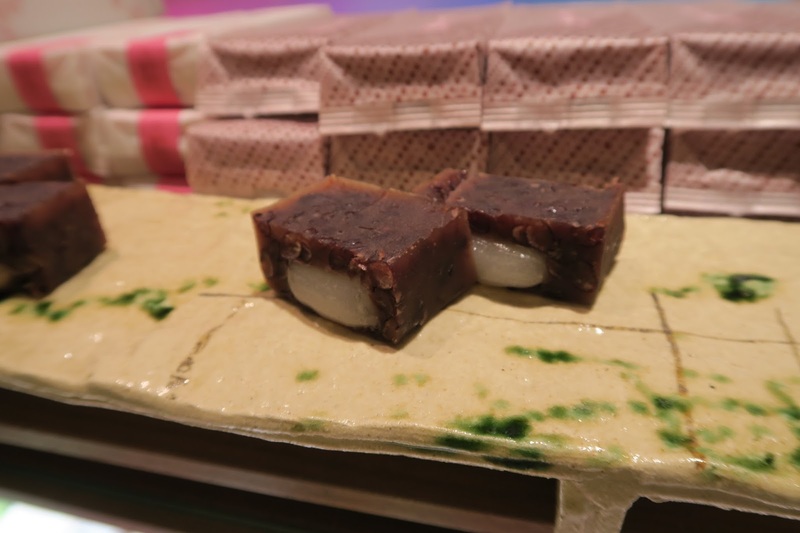 Fake food is surprisingly expensive. But they make fake representations of everything. We moved on to visit a few temples where we prayed for good luck, health and fortune. I believe this was a picture of the wind god. 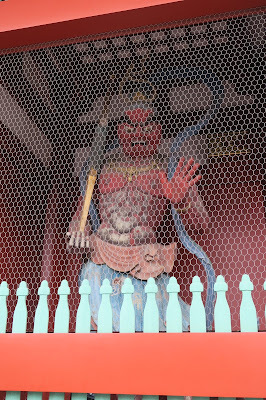 I learned at each of these temples there's always two guardians one with an open mouth and one with a closed mouth. 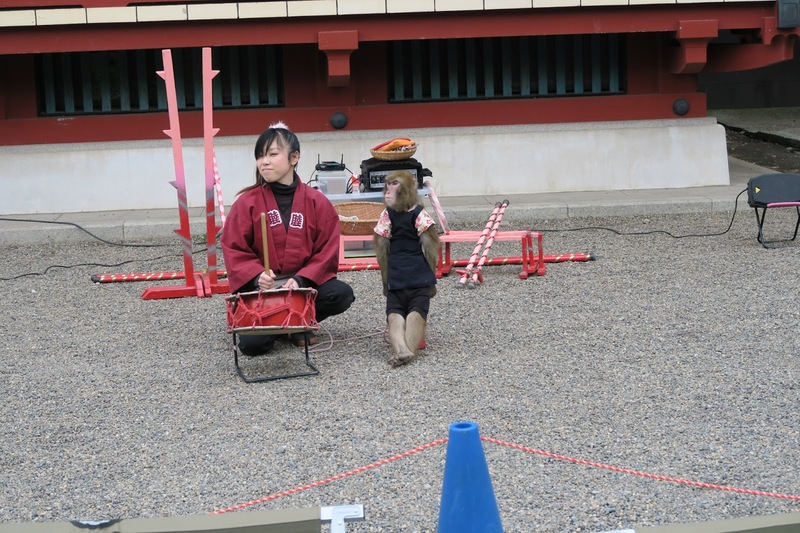 Monkey act next to one of the shrines. 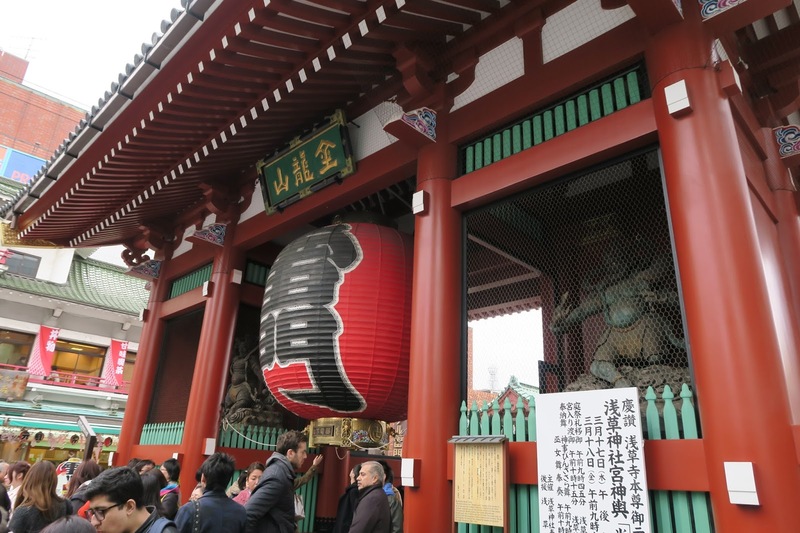 A picture of the famous Thunder Gate which is the entrance to the Senso-ji (pictured at the title) Tokyo's oldest temple. Along the way to the temple was a bunch of charm stands and food stands. 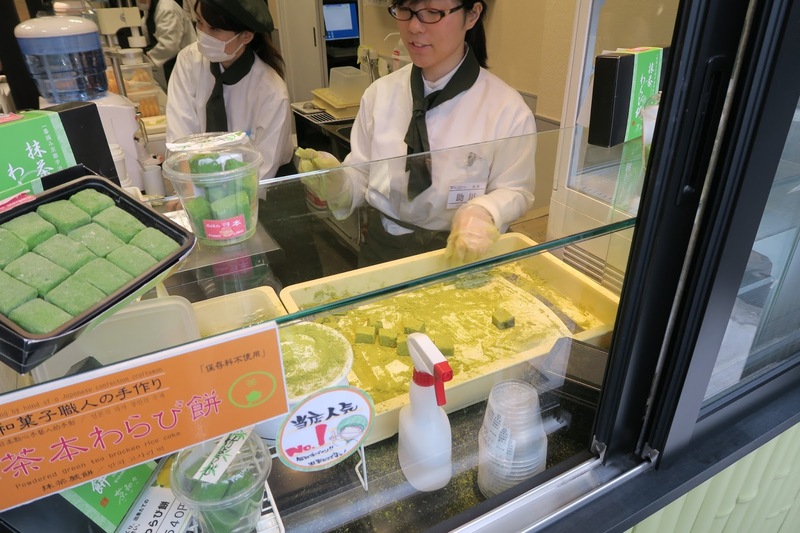 Matcha Warabi Mochi- Green tea powdered covered jelly. 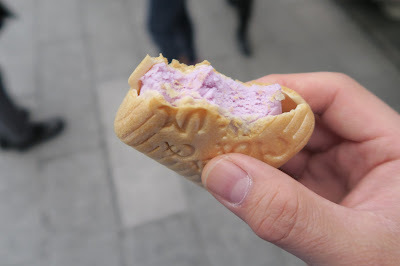 Taro ice cream sandwich, the outside shell was like an typical ice cream cone that they scooped a ball of ice cream into and squashed for me. 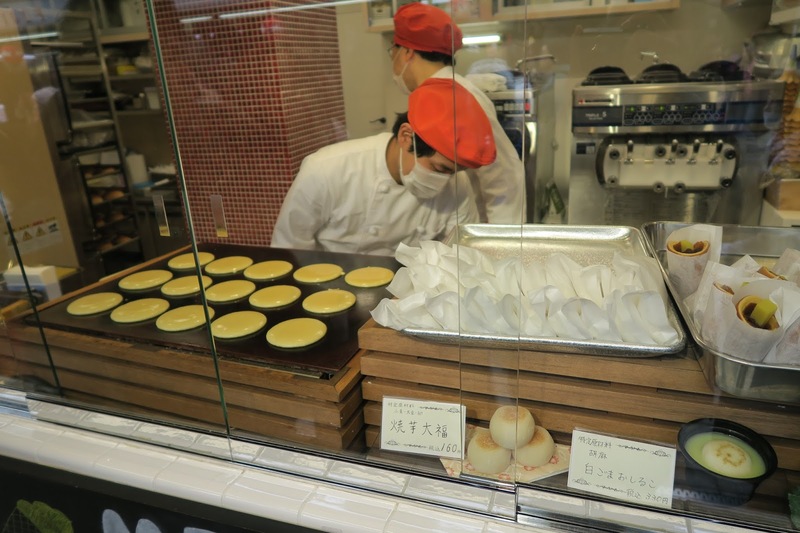 Sweet potato with red bean wrapped in pancake. Lunch we went to the subway station and our friend showed us his favorite "chicken ramen" place Kagari Echika located in the Ginza station. It's a chicken broth based ramen with sous vide chicken breast. The place had seating for eight and even at 3:30 in the afternoon there was a small line waiting to get in. I had only intended to eat a little bit of the ramen but it was so good I ended up eating the whole thing. The broth was a velvety rich chicken broth and it was topped with a bit of sous vide chicken breast and a beautiful decoration of radish sprouts, pickled vegetables and sakura fish cake. 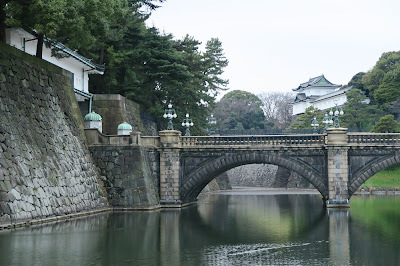 Just before dark we went and visited the Imperial Palace. It was near closing time so we didn't get to go visit the gardens. This isn't the main castle but one of the bridge gates. You can't go to the castle. Dinner we went off to Tokyo station looking for a bite to eat. Most of the major stations in Japan feature a huge underground shopping and dining area. 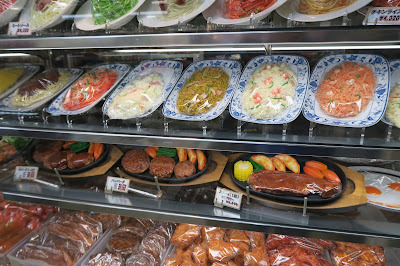 A large food hall area like the one at the basement of Harrods. We found this shop famous for it's red bean cakes stuffed with Mochi. I picked up a savory ume/kombi tea. 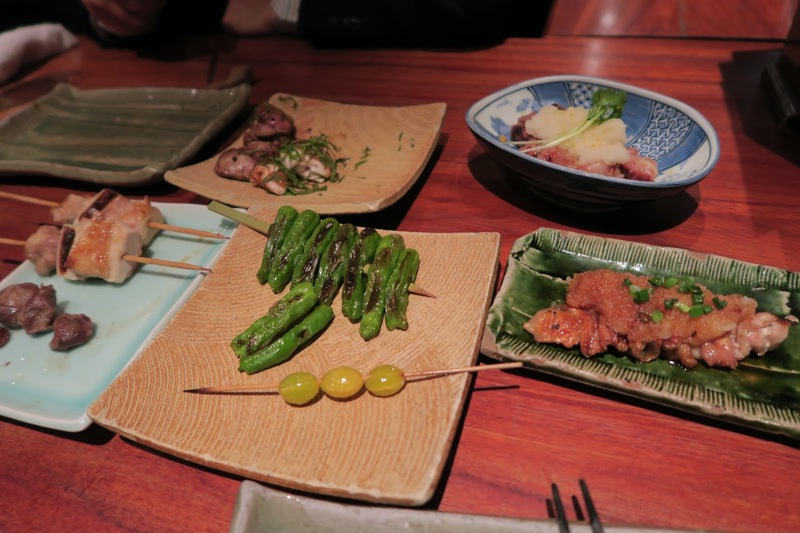 We settled on a izakaya for some mixed skewers for a light dinner. 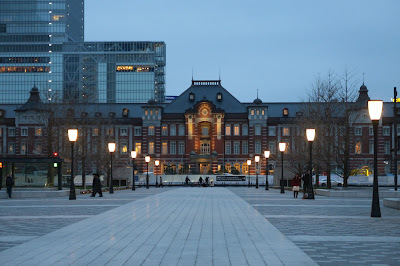 On our last day of walking around in Tokyo we went and saw the Edo-Tokyo exhibit at the Tokyo Metropolitan Museum. 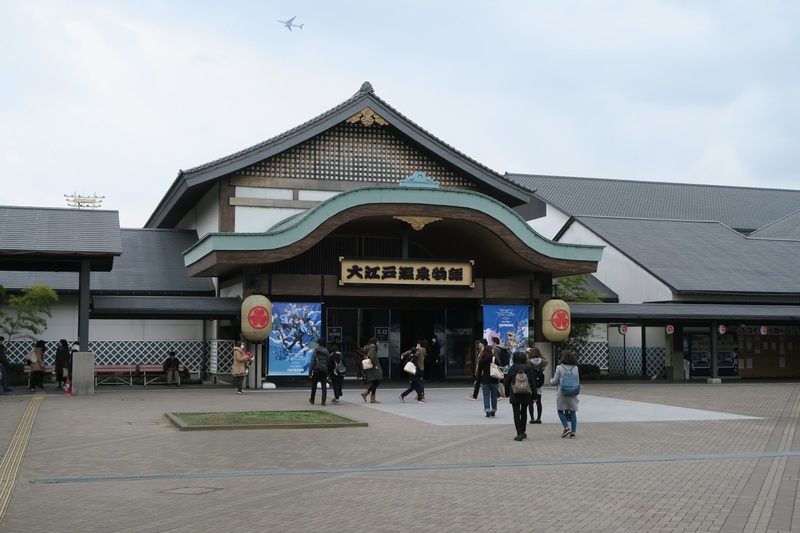 The exhibit was split into two sections, modern day Tokyo and older imperial times covering Tokugawa/Edo period. We spent most of our time in the Tokugawa/Edo part of the exhibit, there was a lot to learn about the era, they covered, commerce, daily life and the caste system. They even had published cook books specialized on various subjects. The above is on pickling but they had one on citreon, and sweet potato. And lots of recreations of the city at the time, parts were prone to fire and they had a major fire demolition the whole city at one point. It was interesting to see the city layout, there were many choke points to prevent invaders from sacking the city as well as exit points to allow retreat from the castle if necessary. It wasn't until near closing time that we realized how much more there was on the modern Tokyo side, so we had to rush through. I was especially partial to the Famicom system pictured here since I did have one growing up. We had lunch back at Tsujiki (because we loved the place so much). I had their Toro sushi lunch. I think the whole thing was like $20 USD which is an amazing price. Apparently they are open 24 hours so if you are ever in need of great sushi they are always there for you. Last stop: Tokyo skytree, this modern marvel was built in 2013. The top most observation deck is 451.3 Meters up overlooking all of Tokyo. The sky tree is divided into two decks you pay for the bottom deck at 350 meters and they upsell you to the top deck at 450 meters. I'd say the view is *slightly* nicer up top since you can get closer to the windows and there's less foot traffic there. And you get to walk up this spiral tunnel up to the "peak". Regardless, the night view is pretty spectacular. The city seems to stretch on forever on all sides (well except for the water side). They also had a "window cleaning" dance show, more of a band and dance with projections on the windows kind of thing. We had dinner at the restaurant level below the skytree The main restaurant (at 345M) was booked, Reservations were recommended. There was a cafe at 340 that served sandwiches and dessert with just as nice a view. A quick shot of breakfast, Tamago, fish cakes, siu mai, sticky rice, congee with condiments (and smoked salmon). Lunch at Ciao Curry. I had the pork, cabbage, spinach and egg curry. Didn't get to order a Tonkatsu but at least I got the curry checked off. I'm writing this on our last full day here. We're just unwinding and taking it easy, it's raining outside and I need a day to recoup before hitting the real world. 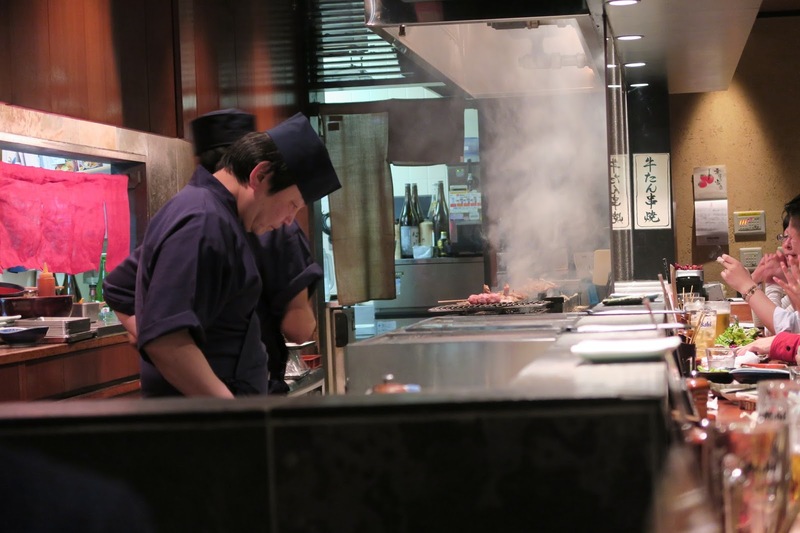 I still plan on posting our two most spectacular meals here as well as Kyoto.